are square, and have a central image and meanings on all four sides. Back Design Green and white circular design. Unlike any tarot or oracle system, the Rainring cards are an intuitive cosmology and a tool for self-knowledge, designed to appeal to emotion, encourage intuition, and enliven the senses, as well as the intellect and reason. The deck has 94 cards, it has 81 ‘pack’ cards in a grid of nine suit-like sets of nine cards; nine ‘umpires’; and four non-umpired cards. They are square, and can be read from four sides. In general, South is Conscious, North is Unconscious, West is Female, East is Male (with some exceptions). There are also three types of reversed meanings with these cards – the opposite of the upright meaning, an absence of the upright meaning, and “a ‘U turn’ whereby the action is now of a totally different form”. On some cards, one side is more important than the others, and so, when using them in a reading, the reader needs to decide which side is to be read, before turning them over. The card names, printed below the illustration, are deliberately ambiguous, vague or verging on wordplay in order to more easily approach the unconscious at a tangent. 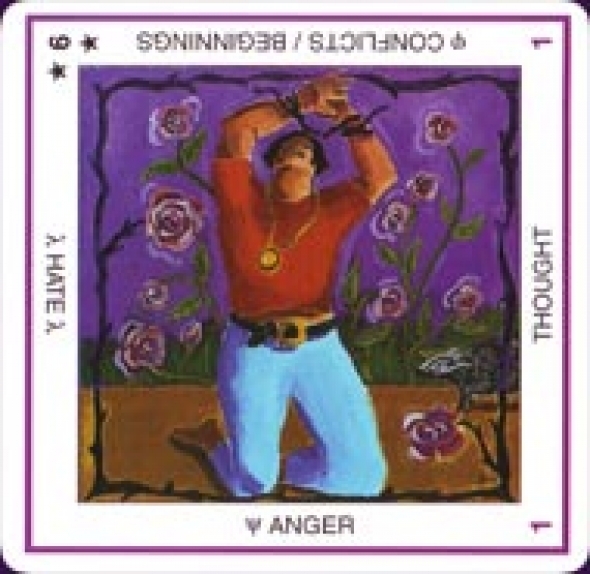 Created by several artists, the art is a little variable across the deck, but is generally expressive. The booklet, Rainring: Healer of Hearts, is without an introduction, and contains some rather complex instructions for reading the cards and explaining the ordering, numbering and groupings. Instructions for spreads follow, for which the booklet says that the pack cards are drawn to form a spread, and the umpire cards are shuffled separately and then read in conjunction with the pack cards. It’s also rather difficult to follow, as it jumps right into the ordering of the cards and their use in spreads without so much as an introduction or explanation of their concept (not helped by the out of order pages). 9/7 Legacy – a permanent deposit in the spirit of man when the excitation of beauty has come to rest; long-lasting influence upon the human psyche. On the back of the cards is a geometric green and white design. The cards were printed by Carta Mundi, so they are the kind of quality you’d find from a US Games deck – a solid stack of impeccably cut, slightly slippery cards. The box is also wonderfully sturdy and made of a thicker cardboard than most card boxes. The Rainring Cards has a complex structure with its ninety-plus cards and four sides of meaning on each, but it encompasses more as a result and can be used as simply as you like for its oracular advice and intuitive insights. Note: I reviewed the original Rainring card pack that was published in 1996, and a much more recent companion booklet. This booklet supercedes the instruction cards that are packaged with the oracle cards.